With low-budget independent movie “God’s Not Dead 2” tracking to bring in between $10 million and $12 million in its first weekend at the box office, it appears The Almighty’s brand isn’t easily diluted. 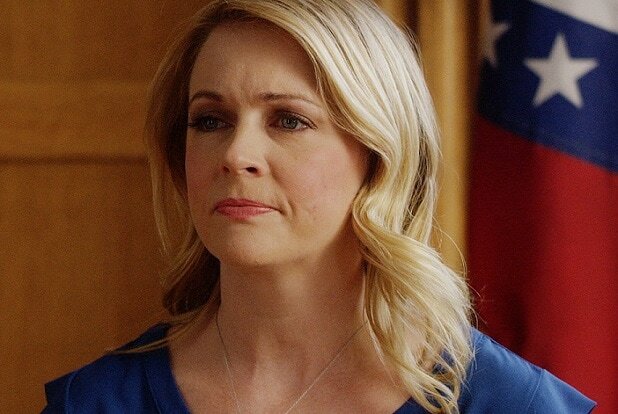 Melissa Joan Hart stars in the film, which opens on Friday nationwide for Pure Flix Entertainment and is the fourth faith-based movie to open nationwide in a little over a month. It will be the first release, however, for the Christian film production company’s new distribution unit headed by former Regal Entertainment VP of Film Ken Rather. He’s already made one aggressive play, upping the theater count for the opening to roughly 2,300 theaters. “That’s a lot more than the original and we were initially planning, but we think it’s the right play, based on what we’re seeing,” Rather told TheWrap. What he’s seeing, in addition to the solid tracking, is an outsize social media profile. “God’s Not Dead 2” has double the Twitter mentions and eight times the Facebook activity of “Heaven Is for Real,” the most successful of the recent wave of faith-based films that Sony debuted to $22 million in April of 2014. “God’s Not Dead 2” is the followup to the 2014 Pure Flix original starring Kevin Sorbo that broke out after opening with $9.2 million (from just 780 locations) and went on to gross more than $60 million domestically. Hart plays a schoolteacher who winds up in a Scopes-type lawsuit after answering a student’s question about the similarities between Jesus’ teachings and those of Martin Luther King and Mahatma Gandhi. Robin Givens, Jesse Metcalf, Pat Boone, Ernie Hudson, David A.R. White and Ray Wise co-star, with Harold Cronk returning to direct. After four films in almost as many weeks aimed at the Christian crowd — and their attendant marketing and grassroots campaigns — you might think some faith-based fatigue has set in, but it doesn’t seem to have so far. “God’s Not Dead 2” is one of two wide releases taking on reigning champ “Batman v Superman: Dawn of Justice” this weekend. The other, Freestyle Releasing’s comedy “Meet the Black,” is projected to open with less than $5 million. “As long as the quality is there and we bring the message that our audience is looking for, I don’t think there will be much cannibalization,” Rather said, noting that the Christian market remains largely underserved. “Hollywood is starting to do a better job with that, though,” he said. “Risen” started the parade this year, opening to $11.8 million on Feb. 19. The drama depicting Christ’s death and resurrection from the perspective of a non-believing Roman soldier has gone on to take in $36 million domestically and another $3 million from overseas, against a $20 million budget for Sony’s Affirm label. “The Young Messiah” followed, opening to a soft $3 million on Mar. 11 for Focus Features. The saga about a young Christ, based on a book by Anne Rice, never found its footing and has topped out at $6.2 million. Sony’s inspirational drama “Miracles From Heaven, produced by Joe Roth and Pastor T.D. Jakes, has been the most successful of the bunch. Starring Jennifer Garner, Mexican TV star Eugenio Derbez and Queen Latifah, the fact-based tale of a young girl with an incurable disease debuted to nearly $15 million the weekend before Easter. The holiday no doubt helped it post a strong $9.6 million over that weekend, lifting the domestic total of the $13 million film to more than $34 million. The most high-profile faith-based films are yet to come. “Ben-Hur,” a remake of the 1959 classic directed by Timur Bekmambetov and co-written by Oscar winner John Ridley, is due from Paramount and MGM on Aug. 12. And “The Shack,” starring Sam Worthington and Octavia Spencer, arrives on Nov. 18 via Lionsgate.